Chichester gained their third consecutive win and kept a clean sheet against their struggling Sussex rivals Hove, winning 22-0. It was not a memorable game but Blues were solid in defence and their backs scored well worked tries. Chi just missed a bonus point when a chance for a fourth try escaped them in the last minute. So their final tally was three tries, two conversions and a penalty. They moved up to ninth place in the league which cheered their supporters. As usual Chi had to make several changes. Charlie Wallace had surrendered his appendix to a friendly surgeon and Martin O’Callaghan took over captaincy. Gareth Davies had been added to the injury list and Dane Gingell failed a fitness test. Callum Gibson returned, Harry Seaman moved to the right wing and Henry Anscombe was at fly half. Toby Golds returned to the left wing. After rain, the afternoon was dank and dismal. Anscombe announced his first-half tactic with raking kicks to touch. A series of scrums and lineouts followed for both sides, none of them too convincing. However the ball eventually went across to the Blues backs to test their opponents. 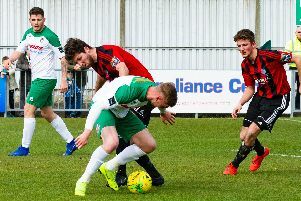 Anscombe put a low kick into Vultures’ Corner as the Hove defence scrambled to block Golds but full-back Charlie Norton was able to touch down. He then kicked a fine conversion – 7-0 after 12 minutes. Chris Johnson excited everyone as he crashed over the gain line three times, but Hove replied with strong driving mauls to the Chi 22. Handling mistakes by both sides, especially knock-ons by Chi, meant more scrums which were fairly even. But the Hove lineout was working better. Their full-back made a great run and Chi had to tackle hard for a few minutes as Hove tried to penetrate without success. Golds was injured and replaced by the talented Ben Heber, visiting from university. The play ebbed and flowed, Sam Renwick was held as he tried a break, and a kick and follow by Anscombe went over the dead ball line. It was 7-0 at half time and Chi needed to do more to put points on the board. Chi were to use their bench players in due course, with Seaman taking a breather and young Kiwi Fin Bamber switching to scrum-half. Hove brought on former Worthing and Cornish Pirates veteran Ryan Storer to bolster their front row. Norton got things moving with a successful 30m penalty. At the other end Hove drove their maul to the right corner but were held by sterling Chi cover and tackling. Norton was almost on target with a penalty from 40m but it fell just short. Blues stepped up a gear with attacking runs by Johnson and Heber. The Chi pack seemed to drive across and press down but the referee ruled held up. The backs kept the momentum and Renwick took a pass at speed and broke a tackle to dive over. Conversion by Norton, 17-0. Hove gallantly tried again but their backs lacked the tactical variety to penetrate. From lineout ball Chi backs pressed again and Rhys Thompson scored the third try right of the posts. The conversion was not taken as Chi rushed to go for a bonus with time running out. The last chance arrived when the dynamic and strong prop Sam Drayson sprinted at great pace out of defence and across half way to the beckoning 22 when he was confronted by the last defender. He attempted a lobbed pass to the wing but it fell into the arms of a relieved opponent. Final score 22-0. Chi go on Saturday to Cobham where a stiff test awaits. Chichester: Drayson, Geal, Woods, O’Callaghan, Gibson, Bowden, Makasi, Johnson, Seaman, Anscombe, Golds, Thompson, Renwick, Bamber, Norton, Cameron, Magda, Heber.